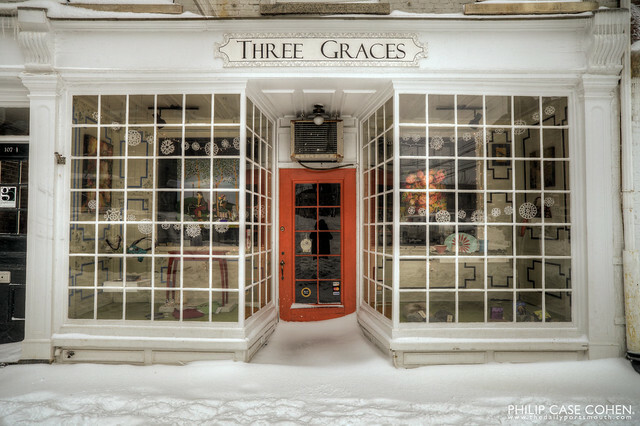 This welcoming storefront belongs to Three Graces Gallery on Market Street downtown. The gallery’s location on Market Street usually gives it gorgeous sunsets, with rich intense rays of sunlight reaching down Hanover Street to hit the storefront for a few minutes before retiring for the day. The shop also has a gorgeous hanging sign, but there’s something about a straight on shot of a store with a good door that I can’t get enough of. More shots to follow of the hanging sign and of the window soaked in sunlight to follow another time… If you love art, do yourself a favor and stop in to see the one of a kind items featured in the gallery. Currently, the Teeny Tiny Art Show VIII is featured and well worth a visit.